How well can kids distinguish between good habits and bad? Do they know ignoring somebody even when one is down is considered to be inappropriate and wishing folks a good morning everyday is an awesome manner that is desirable in all of them? The social skills worksheet is just perfect for your fifth grader at home who wants to practice his social skills on paper. 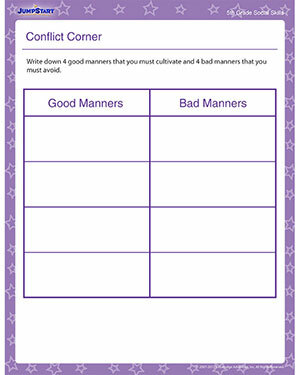 Download the free social skills printable and let them form their own perspectives on good and bad manners.